Global stocks mixed amid the increasing confusion over the impact of Prime Minister Theresa May’s historic parliamentary defeat on Brexit last night and concern over the lack of progress in U.S.-China trade talks. U.K. lawmakers will debate a non-confidence motion in May’s government later today as EU officials plead for flexibility from London to avoid a so-called “hard Brexit” on March 29. 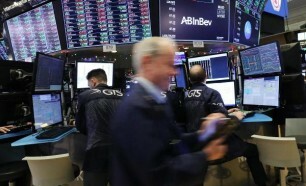 U.S. equity futures indicate a solid open on Wall Street Wednesday after stronger-than-expected earnings from two of the country’s biggest banks offset concern over last night’s crushing Brexit defeat for U.K. Prime Minister Theresa May and worries that progress in U.S-China trade talks may have stalled following reported comments from Washington’s top negotiator. Goldman Sachs (GS) smashed fourth quarter earnings estimates with a bottom line of $6.04 per share, well ahead of the consensus forecast of $4.45. Group revenues were also surprisingly solid, at $8.08 billion, sending shares nearly 6% higher and adding 45 points to the Dow Jones Industrial Average. Snap Inc. (SNAP) shares extend declines in pre-market trading as investors reacted to sudden resignation of CFO Tim Stone after just eight months with the group, the latest in a series of top management departures from the instant messaging app creator. Snap shares were marked 11.3% lower in pre-market trading Wednesday, indicating an opening bell price of $5.80 each, the lowest since January 3. The move would take the stock’s decline from its IPO debut record of $24 a share past 75%. Fiserv (FISV) said Wednesday that it has agreed an all-stock deal to buy rival payments and financial technology provider First Data Corp. (FDC) in a deal that values the group at $22 billion. The humiliating verdict triggered an immediate vote of no confidence in her government, which will debated later today, adding to the growing uncertainty surrounding the fate of two of the world’s biggest economies. Markets in both Europe and Asia were further unsettled by comments reportedly from U.S. Trade Representative Robert Lighthizer, as told to reporters by Republican Senator Chuck Grassely, that U.S.-China trade talks aren’t progressing as far as investors may have anticipated. “So structure-wise not much progress, but the Chinese are coming over here in a couple weeks and there will be more negotiations,” Grassley added. The twin uncertainties, coupled with a weaker-than-expected reading for core machinery orders from Japan for the month of November, a key barometer for investment growth in the world’s third largest economy, kept markets in the region muted, with the MSCI ex-Japan index edging 0.09% higher and the Nikkei 225 sliding 0.55% to close at 20,442.75 points. The U.S. dollar index was marked modestly higher at 96.12, although that move was held in check by a weaker euro, which slipped to 1.1391 following last night’s Brexit defeat and data yesterday which showed Germany’s economy grew at the slowest rate in five years last year. Benchmark 10-year U.S. Treasury bond yields, meanwhile, drifted to 2.709%, while two-year notes were marked at 2.533%. European stocks, on the other hand, were able to book modest mid-day gains of 0.2% thanks to the weaker euro, with the Germany’s trade-sensitive DAX performance index slipping 0.1%. Britain’s FTSE 100 slipped 0.6% by mid-day trading in London, even with solid gains for domestic banks such as Barclays (BCS) and U.K. homebuilders such as Barratt Developments (BTDPY) .